Mindfully Bertie commends the Daily Telegraph for publishing the article below. 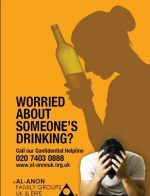 In doing so, we see an opportunity to also commend an organisation whose sole purpose is to help those who suffer from other people’s drinking. Those affected by an alcoholic. Al-Anon. Does not promote itself, but offers you and everybody else reading this blog the chance to find serenity in the mad world created by alcoholism. It may not be for everyone. All we suggest is that you give it a try. Bobby is convinced that the combined affects of his own anxiety (GAD), and his beloved Diddley’s drinking, would have been unsustainable had he not found the rooms of Al-Anon. We urge you to read the Daily Telegraph article that follows. And consider if you or someone you know is struggling with life in the way in which the writer so eloquently describes it. Situations so familiar to members of Al-Anon. This article is about the affect of one person’s drinking on another. In reality it goes far beyond that in affecting a whole raft of people. Family and friends. Even after you have lost the alcoholic the affects of their disease will continue to affect their loved ones long after. This is the case in Bobby’s family. Diddley would have hated her name being used in this manner. She didn’t have a problem. For she was a functioning alcoholic. She didn’t hide drink. Really! Never humiliated Bobby. Really! Always loved him and never meant to hurt him. Even when declaring that life was not worth living when told officially that her body could no longer survive alcohol. So Bobby says sorry to the love of his life and hopes that by telling the story that others may gain some comfort and knowledge. This week’s candle is lit in St Anne’s church, Soho. Just a few yards from Shaftesbury Avenue and Theatreland. A church founded in 1686 and destroyed by a German bomb in 1940. Leaving just the steeple. For years, the church grounds were used as a car park and complete demolition forecast. Until a committed set of determined people re-founded the church by building modern rooms within the grounds and turning the remainder into a garden. It’s a remarkable story of fighting adversity. One that I doubt I would ever have known had it not been for writing a blog dedicated to those l love and their memory. The Church of St Anne Soho. The garden. Entrance in the street behind. The original interior around 1890 (bottom left), the tower, from a sketch in 1840 (bottom right), and the bombed exterior in 1940. Rebirth – new foundation stone laid March 1990 by the Princess Royal. Lighting a Candle in St Anne’s Soho. Thanks for the reference to the Telegraph feature, Bob. Its helpful to know we’re not alone. Hope to be kicking off a new blog of my own soon, possibly about the science teacher training I’m starting in September. Thank you Maria. As you know we are not alone but largely unheard of. Make sure you send your blog to me when you start. Living with alcoholism is lonely. Al-Anon taught me it’s an illlnes and gave me a network of friends who were in the same boat. I still attend meetings because it’s given me serenity joy and solutions to everyday problems…the meetings are full of laughter and tears.